Accon may not be a name that is familiar to a lot of readers but even if you have never heard of them my guess is that you will have either been on a boat with some of their products fitted or at the very least seen them at one of the boat shows. Black Fin and Regulator sport fishing boats both feature the smart Accon pop up cleats which keep the deck clear and avoid damaged toes and feet. But now Accon have come up with pop up lights, which like the cleats sit flush with the surrounding deck when not in use but flip up at night when you require navigation lights. LED powered the 210 model shown at the bottom is a 2 mile visible nav light that complies with current USCG regulations. I like the look of these lights a lot and I expect that they will find favor with a lot of the fishing guys who generally go out only during the day but have to have nav lights in case they head out in the early hours or get back late. The 210 model is available direct from Accon and has a list price of $177, expensive by some standards perhaps but it's hard to put a price on style. If you are anything like me then you have a list of jobs and projects on the boat that you promise to get around to one day but never seem to. Well one of those on Mallard has been the installation of an Oceanair screen which I have just got around to after what must be 3 years. These really are a beautifully made piece of kit and to my mind at least look fantastic. Available in a variety or standard and custom sizes they blend seamlessly with deck hatches from Man ship, Lewmar and the like. The model that I have installed is the surface model as shown above but you can get recessed models which can be incorporated into the overhead providing you have room, I don't. Even so the surface models are very smooth and stylish and hardly project down from the overhead at all. The screens come with easy to follow installation instructions but I have found that it pays to take time to ensure that the mounting surface is square and true. Any distortion or twist in the substrate will similarly impart twist into the screen which will then not operate correctly. It really is two in one product as a mesh bug screen pulls from one side and a blackout blind pulls from the other. The former keeps even the Maine black fly at bay and the latter turns day into night which as I like to sleep in total darkness suits me just fine. A strip magnet runs along the front edge of the bit you pull over and keeps the blind securely closed and also as you can see from the top photo both the screen and shade can be pulled to meet in the middle thus varying the amount of light getting through into the cabin. Easy to install, they look good and work perfectly, all in all a great product and a nice upgrade to the boat. Fans of On Board will know that I am very keen on LED lights so was pleased to see these babies from Lumitec. The picture shows the flush mount version which would be a great fitting for the bridge deck of a sport fishing boat for lighting up the cockpit. There are other versions which would be suitable as spreader lights on a sailboat for lighting up the deck or as a spot light for a work boat. The lights look pretty cool, resistant salt water and I do especially like the rounded and nicely smoothed off casing which would complement many boats. The overall dimensions are small too, the light has a foot print of 5 inches long and 1 3/4 inches wide and the cut out is a diminutive 3 3/4 by 1 1/4 inches so these lights should fit in many places where traditional halogens would refuse to go. The light output of this model is claimed to be equivalent to a 55 watt halogen which is plenty of light so a couple of these would give plenty of light for working in the cockpit or on deck. The light has a MSRP of $194. Since I wrote about Aqualuma lights a couple of months back the list prices have been reduced to $310.96 for the 1 Series to $998.27 for the Tri Series although you can get these even cheaper by dong a quick Internet search. While this still does not make them the cheapest lights around it does make them more affordable for many boat owners. Unlike many of the other underwater lights on the market these are LED powered rather than the more popular metal halide variety. I have installed some on m own boat this past year and will bring you some step by step pictures of the installation in a later posting. Unlike the metal halides which run very hot and will fail in short order if not surrounded by cooling water the Aqualuma lights never get hot, can be run out of the water and use far less power, the series 3 uses less than half an amp when running on 12 volts. 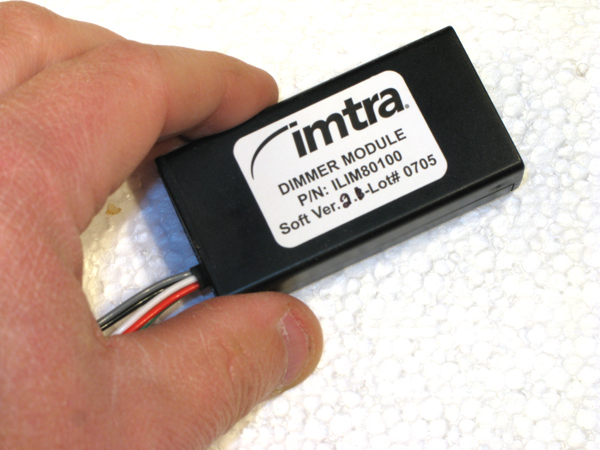 Imtra is a name that is familiar to a lot of boat owners. They make and sell a lot of good quality products including side power bow thrusters and Glomex antennas but they also produce some excellent LED lights. LED lights are a bit like digital cameras just when you think that you have the latest and greatest and they can’t possibly get any better along comes a new one to disprove that myth. Brand new this year is the Ventura Power LED, which is an exceptionally low profile spring mount light fixture. At first glance this is very similar in a appearance to the Hatteras lights that I fitted last year except that the overall size is slightly larger both in terms of the overall diameter, 81 mm as apposed to 73 for the Hatteras and depth which is increased by a couple of millimeters. The slightly increased size is to account for the larger sized driver required for the LEDs. The Hatteras has a power output similar to a 10-watt halogen but the Ventura ups this to an equivalency of 25 watts. I mounted the light to a board in the workshop which was as near as I could replicate to the interior headliner on a boat so that I was able to conduct some tests of my own, radio interference, heat, power consumption and light output. I connected up the light following the manufacturers installation instructions, which are easy to follow as you might well expect for a light. As with many of the Imtra lights the Ventura is fully dimmable so I connected in the PWM dimmer and a momentary switch. The dimmer is optional in which case the two of the wires coming from the light fixture are not required but frankly the dimmer is so worth having that I can’t see many people not opting for this, one dimmer will power up to 15 lights. Using a momentary switch with the PWM dimmer does away with the need for a rheostat style dimmer, push the switch once to turn the light on and push again to turn off. Holding the switch down either dims the light or turns it up, the dimmer also remembers the last setting so if the light is turned off at 50% power it will come back on at the same setting the next time – really cool. Light output was impressive and provided a good spread of illumination, my workshop is wood lined and not very reflective but some of these lights inside a white or light colored cabin would appear even brighter. I tested the warm white, which has a color temperature in the 3,500 kelvin range although the reading that I got was actually slightly more at 3,600k when measured with my temperature meter. Cool white is also available and this has a Kelvin reading of 5,500 which is pretty much the same as midday sun although this can look pretty harsh on the interior of some boats so my guess is that most folks will opt for the warm white. Power consumption is just a shade under five and half watts so at 12 volts you will be sucking less than half an amp from the batteries, a halogen light with a similar output will draw over 2 amps most of which will be converted into heat. I ran the Ventura all night and it never got any hotter than mildly warm halogens are too hot to touch after being on for more than few seconds. For the final test I placed the light close to various radios, a ham set, marine VHF and TV set which is not a very scientific way of testing for radio interference but scanning through the channels with the light on and off I could not detect nothing of any significance. Incidentally the Ventura has a list price $129. Seems like just yesterday that we were giving each other Christmas gifts and guess what, Valentine's Day is here. My wife Rita thinks that all Valentine's Day gifts should be lovey-dovey. but then she might not be such a hard-core boater as me. So to satisfy all tastes here is a round-up of suggestions that are sure to appeal to everyone. You wouldn't believe how many gift suggestions were sent to me. Some of them, like the guy flogging a square foot of land overseas to all those who want to be international property owners! Unbelievable! So I've sorted through them all and put together a selection costing from just a few dollars to several hundred any of which would be welcomed by any boating inclined member of the family at any time of the year - not just on Valentine's Day. They're well-known for the range of watches they have been making since 1860, but until these arrived in the mail some time ago I had no idea that TAG Heuer made sun glasses as well. These are from the AIR range collection. They look stylish, are comfortable to wear and the soft neoprene ends grip well so they will stay in place when you are on the boat. The wrap around style of the lenses stops glare from entering around the sides..an absolute must when you're out on the water on a sunny day. Prices vary depending on the exact model and run from around the $230 mark. Not the cheapest sunglasses that you will ever buy perhaps, but certainly some of the most good looking and effective. If you decide to wrap these up for your Valentine, just be sure to invest another 5 bucks in an eyewear retainer like the ones made by Croakie. As they say, "better to be safe than sorry!" I’ve never been a great one for drinking beer, but I do enjoy a drop of whisky from time to time. Always something of an acquired taste and not all whiskies are created equal. Single malts are at the top of the tree and although more expensive than blended whisky, they are far smoother with each distillery producing their own distinct unique tipple. The trio shown here includes the Glenrothes, which is a Scottish Speyside whisky, Tullmore Dew from Ireland and Yamazaki from Kyoto in Japan. I'm a fan of first two, but the Japanese whisky was completely new to me. Now that I've indulged, I must confess that I have developed quite a taste for it. The booklet describes it thus ‘ a 12 year old that is slightly syrupy, honeyed in flavor, perfumey, with a cookie like dryness in the finish’. Whichever you choose none of these will disappoint a true whisky drinker. A great gift when visiting a friend’s boat for the weekend and a sure fire guarantee that you will be invited back. Incidentally, we've got a few great whisky cocktail recipes that I just might feature on St. Patrick's Day. I know you won't be disappointed in the ones that include Tallmore Dew. Regular readers of On Board will know that I am very keen on LED lighting for a ton of reasons; the low power consumption, the fact that you never need to change a bulb and the small overall size of the fitting. These courtesy lights look perfect for stairways and other low level applications and although I don't have anywhere to fit these lights right now I will probably install them on my next boat to light up the stairway at night. Interestingly they are available in Red, White and Blue, the latter color has recently been found by the navy to be better for preserving night vision than red which was always thought to be the best color. Having tried blue lights on the chart table I can confirm that my purely unscientific tests do seem to indeed show this to be the case. These Hella 8560 Series Courtesy Lamps from Hella marine retail for around $25.99, weigh next to nothing and have overall dimensions of 1.7" Long x 1.2" Wide x 0.8" Deep. Hella tells me that they consume less than half an amp at 12 volts but my tests confirm that it is actually slightly less than this nearer .4 amps. I'll bring you a few more pictures of the blue lamps just as soon as I have them fitted into the boat. Tags: Boat, Boating, DIY, Hella, Mark Corke, On Board, yacht. I have had few e mails from readers asking for extra information on boat wiring. Whole books have been written on the subject and I am certain that wiring on a boat is something I will be returning to again and again in On Board. To help you get started here is table to assist you in choosing the correct size cable for almost any job on board. The chart is fairly easy to follow but a few tips may help if you are at all unfamiliar with electrical wiring. The column on the left is the distance in feet that the cable will run and the maximum amperage draw on the circuit is shown across the top starting at 5 amps and finishing at 100. As an example say you want to install a 25 watt light located 30 feet from the distribution panel then the first thing to do is figure out the amps that the light will draw. AMPS = Watts/Volts thus 25 watts /12 volts = 2.08 amps. As the smallest cable listed is for 5 amps we will use this and in any event you should always round up to the next larger size if the number falls between two of the amperage figures. Following the 5 amp column down we see that the size next to 30 feet is 12 AWG (American Wire gauge) but, when calculating the figures it is the complete circuit length that we are concerned with which is double the 30 feet as the cable has to run to the light fitting and back to the panel making this 60 feet in total which makes this 10 AWG, the next size larger. Using the wrong size cable will lead to voltage drop and in this case would cause the light to be dim and in cases where the cable is way undersized could lead to overheating of the circuits. Regular readers will know that I am a keen advocate for LED lighting which draw significantly less current than incandescent bulbs. Given the price of copper cable considerable cost and weight savings can be made as the cables needed to supply LED will be significantly lighter in gauge. One final point, using the correct colored cable helps in tracing circuits later. The universally accepted colors are listed below. The chart may look a little small on your computer screen but you can make it larger by clicking anywhere on it which will make it easier to read. These are something that has no place on a boat - wire nuts. I recently surveyed a power cruiser which had lots of alterations to the electrical system, not only were many of the connections made with wire nuts the cable was solid core rather than multi strand tinned boat cable, both of which are a big no-no on a boat. Wire nuts are not moisture resistant and cable with a solid core is susceptible to vibration and fatigue eventually leading to failure. For the complete step by step guide to making proper electrical connections continue reading ..
Now here is a nifty little tool that I have been having fun with. It's an infrared thermometer that measures temperatures very accurately. I am sure that there are other makes, well I know there are but this one is from Fluke and since borrowing it I have found all sorts of uses for it around the boat. As it is a non contact tool I only have to point it at whatever it is that I want to measure the surface temperature of, pull the trigger and hey presto an instant readout. But the point of me telling you all this is that I have had the chance to take accurate readings from the old and new cabin lights fitted to a 38 foot sailboat. It has to be said that the illumination left much to be desired there were many dark spots in the cabin and reading a book or chart was difficult unless you sat directly under one of the original dome lights. As an upgrade we removed the old lights and installed new Imtra Hatteras LED lights. Not only has this provided much needed extra illumination but they also look great. I have been totally sold on the use of LED lights on boats for some time and use them everywhere on my own boats including navigation lights. LED's don't burn out and use far less electricity than incandescent bulbs. However one thing that is often overlooked is that they also produce significantly less heat.